Harry The Librarian: A Different Kind of Data Breach! A friend just shared a video on Facebook, "Never Trust a Photo Copier." You can see it on Youtube. An investigator purchased four random used photocopiers at a warehouse, pulled the built in HARD DRIVES, and found medical records, social security numbers, highly personal documents, everything that had been copied on that machine. Yikes! My response: I am embarrassed that I never thought this through. 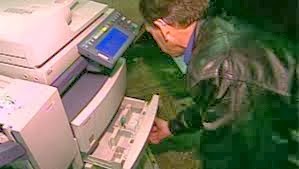 The video says a 2008 study found 60% don't know copiers store digital images of scanned items. I'm betting it's 99%. I understood that a document was digitized during the copying process, and "held in memory" for as long as the requested number of copies were being printed, but assumed they would then be replaced by the next image. Perhaps that's because I'm old enough to remember when storage was so limited - the days of truly floppy "floppy disks." Today's hard drives hold a frightening amount of data.